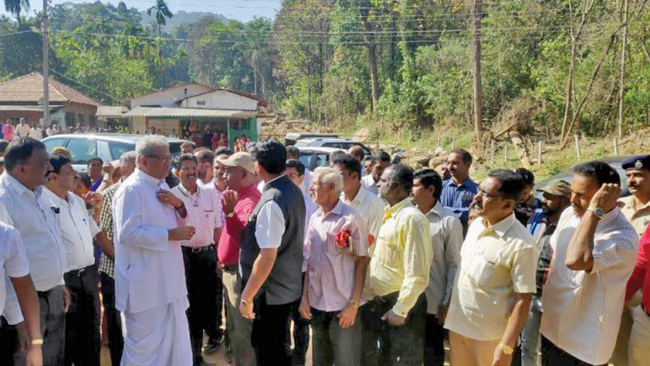 Madikeri, Jan 10: Dharmasthla Dharmadhikari Veerendra Heggade distributed Rs 8 crore as relief to 1106 victims affected in flood and landslide of Kodagu district on Thursday. Following the natural calamity in August last year a survey was undertaken by the Srikehstra Grama Abhivruddhi Yojana to identify the victims for distribution of relief. Relief was distributed to other victims also. As per the survey who last houses will get Rs 25,000, farmland Rs 25,000 hosuehold articles of Rs 20,000 and those who last everything will get Rs 65,000. Most of those who were provided relief were from Jodupla, Amonnageri, Made and Udayagiri, which were among the worst affected areas.